Many people who are new to Spain and not sure what to visit want to know about the best cities in Spain. But what if you don't want to spend all your time on a train, joining the dots between Spain's far-flung cities? It's best to stick to a single region and exploring that in depth before moving on. But not all Spanish regions are created equal. Some should be at the absolute top of your list of destinations, others less so. After the aforementioned regions and towns, the other places are all worth a visit. They represent the full spectrum of what Spain can offer the visitor. Melilla and Ceuta are both Spanish enclaves in North Africa and amount to the same thing to the visitor to Spain: They are there as ports to catch a ferry from mainland Spain to Morocco. But you're better going to Tangiers in Morocco itself instead. Melilla is even worse than Ceuta because the stretch of the Mediterranean between here and mainland Spain is so wide that the crossing takes much, much longer. Best for: Putting Spain's hypocritical stance on Gibraltar into perspective. Spain is allowed enclaves in Africa but the UK is not allowed them in Iberia? Alternatively... Visit Morocco by traveling from Tarifa in Andalusia to Tangiers. The better of the two Spanish enclaves, but you're still better off going to Tangiers instead. Best for: That Gibraltar connection again. Alternatively... Travel from Andalusia to Morocco. Trapped between Madrid, Barcelona, and northern Spain's delights of the Basque Country and the Rioja wine region, Aragon has its own stretch of the Pyrenees, though most of the best skiing is found on the French side. Zaragoza has two cathedrals, both of which are great, but then I could say 'there is a nice cathedral' for every region in Spain. Read more about the region of Aragon. Best for: Stopping for lunch en route from Madrid to Barcelona. Alternatively... La Rioja and the Basque Country are nearby but with a whole lot more to do. The Picos de Europa mountain range is found partially in Cantabria, but you can visit them from Asturias too. Santander's beaches are found in a bay, which means you can see land as you look out 'to sea', which is a nice curiosity. One of Gaudi's lesser known works, El Capricho de Gaudi, can be found in Comillas. Best for: Greenery, seafood, and being even more off the beaten path than the other quiet green, seafood-obsessed regions nearby. Alternatively... Galicia and Asturias are just as green and relatively tourist-free. The weather here is nice, which is great for visiting the beaches, but that is true for the whole of the south coast. The city of Murcia has a nice cathedral, but this is true for most cities in Spain. Cartagena has some impressive Roman ruins. Best for: Beaches and Roman ruins. Alternatively... Catalonia has both of these, particularly the city of Tarragona. Pamplona, famous for the Running of the Bulls, is fast becoming a regional star for its cuisine, but then so are nearby San Sebastian and Logroño. Navarra is wine country, but the nearby regions of La Rioja and the Basque Country are both better and more accessible for visitors. Best for: Wine and bull runs. The Canary Islands are situated off the coast of Africa, with a hot climate to match, which is great for the beaches. But its distance from mainland Spain makes visiting anywhere else on your trip difficult and expensive. The main Canary Islands of tourist interest are Fuerteventura, Gran Canaria, Lanzarote, and La Palma. Best for: Beaches and guaranteed warm weather. Alternatively... The Balearic Islands or Andalusia. Closer to mainland Spain than the Canary Islands, makes it a cheaper destination and allows for visiting other Spanish cities on your trip, but you're mainly coming here for the beach and nightlife. The main Balearic Islands of tourist interest are Ibiza, Formentera, Majorca, and Menorca. Best for: Beaches, warm weather, and slightly cheaper flights than to the Canary Islands. Alternatively... The Canary Islands or Andalusia. Off the beaten path for most tourists, Extremadura has the beautiful city of Caceres and the country's best Roman ruins (in Merida). Alternatively... Catalonia has Roman ruins too (though, admittedly not as nice as in Merida) and a whole lot more besides. The city of Valencia has its own autonomous community - its biggest draw being its beaches and for being the birthplace of paella. Alicante is a great city for tapas. Best for: Paella and beaches. Alternatively... You can get good paella all over Spain, even in Catalonia (if you know where to look). La Rioja is where the best wine in Spain is produced. The sight of the clouds rolling over the hills, essential to the wine production, is unique to this region. Logroño, the capital, has some of the best tapas in the country. La Rioja is close to the Basque Country and makes a great excursion from San Sebastian or Bilbao. Best for: Wine and tapas. Alternatively... Nearby Basque Country is more famous for its tapas, though it is more expensive and not necessarily better. Seville and Granada are also renowned tapas cities. Drink cider like only the Asturians do and find out why the Spanish say "Asturias is Spain, the rest is just conquered'. Oviedo is the capital of the region, with its Bulevar de Sidra (Cider Boulevard) a popular tapas and cider destination. Up on the hilltops overlooking the city are three fantastic pre-Romanesque churches (pictured). Best for: Cider and the unique Asturian food. Alternatively... There is cider in the Basque Country too, though it's not quite as prevalent. There is no substitute for Asturian food. Castilla-La Mancha is a vast, largely empty and sparsely populated region, but it has three cities that are well worth visiting. Toledo is the most popular day trip from Madrid. The city of three cultures has a strong Christian, Muslim, and Jewish heritage. Consuegra is the best city to visit for the classic view of the windmills, made famous by Cervantes' Don Quijote. Consuegra is easily visited from Toledo. Cuenca, on the high-speed AVE train line from Madrid to Valencia, is known for its casas colgantes, houses that appear to hang off the side of a steep cliff! The city also has an unusually high number of modern art galleries! Best for: Experiencing the Castilla of old, with its stories of castles and knights in shining armor. Alternatively... Castilla y Leon is the other half of historic Castilla. Visit Old Spain - the roots of the Spanish language and civilization can be found in this region. Leon is one of the best cities in Spain for tapas, not least because the food all comes for free if you buy a drink! Segovia is famous for its 2,000-year-old Roman aqueduct and Disney-esque fairytale castle. Salamanca has the most beautiful main square (Plaza Mayor) in the whole country, while the cathedral in Burgos is worth a visit. Best for: Walled cities and historic castles and churches. Alternatively... A visit to Castilla isn't complete without visiting the cities of Castilla y Leon too. The biggest attraction in Catalonia is obviously Barcelona, which is enough to elevate it to above most other regions in itself. But you also have the Roman ruins of Tarragona and the walled city of Girona as well as the Salvador Dali Museum in Figueres. Alternatively... Madrid is Spain's other major city and it has better day trips. San Sebastian is one of the two most famous cities in Spain for tapas, while also having the best city beach in the country. Bilbao is home to the Guggenheim Museum, an attraction more famous for its architecture than for its exhibits (though those are great too). Then there's the coastline (great for surfing) and local wines (the Txakoli, a bit sour and ever so slightly sparkling, is as great as it is unique) and the proximity to the Rioja wine region and France. Best for: Superlative cuisine, ravishing coastline, stunning landscapes, and the Guggenheim museum. Alternatively... Only Madrid and Catalonia can offer such cosmopolitan culture, though it is more concentrated here in the Basque Country. The biggest city in Spain is found in the region of the same name. Madrid has everything you would expect of a European capital, with the Royal Palace of Aranjuez a short trip away. But more than with any other region in Spain, it wouldn't be fair to judge Madrid solely on what is in the official Madrid jurisdiction. Segovia, Toledo, Avila, and the Valley of the Fallen (El Valle de los Caidos) are all an easy day trip away, and even Cordoba in Andalusia can be reached on the high-speed AVE train. Best for: Madrid is the capital of Spain in every sense of the word. Culture, food, wine, museums and more can be found in Madrid. Alternatively... Barcelona is the obvious ​other choice. Catalonia may claim to be different from the rest of Spain, but Galicia really is. The old town in Santiago de Compostela is probably the most beautiful in the country, its centerpiece being the 12th-century Gothic cathedral. A Coruna has its Roman lighthouse - the oldest in the world - and a great tapas scene. But it's not just about culture. Galicia is home to also has the most beautiful beaches in the country (on the Cíes Islands, just off the coast of Vigo) as well as the warm springs of Ourense. But it's the breathtaking Atlantic coastline and rolling green hills - best experienced by walking some of the Camino de Santiago - and the best seafood in the country that makes Galicia such a wonderful region to visit. Best for: Greenery, seafood, and some of the oldest sights in Europe. Alternatively... Asturias is just as green. 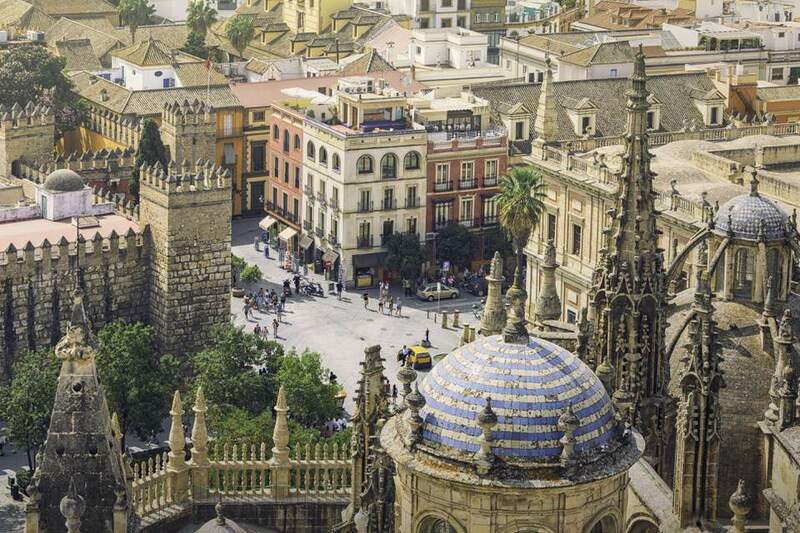 It's worth visiting Andalusia just for one of its two big draws: Seville and Granada. Seville is the archetypal Spanish city - it looks exactly how you always thought a Spanish city would look. It has flamenco, bullfighting, great tapas, and one of the biggest and most impressive cathedrals in the world. Granada's tapas is also fantastic - but in a different way. Here your tapas comes for free with every drink, which encourages a vibrant culture of eating, drinking and bar hopping. And then there's the Alhambra, the epic Moorish fortress and garden complex, across the valley from the medina-like Albayzín. Visit Cordoba for the Mezquita-Catedral, the mosque-cathedral hybrid that has been the city's biggest place of worship for two religions. Go to Cadiz, the port city famous for its fried fish. Then head to Jerez, where sherry was invented. Tour the pueblos blancos, the white villages that are dotted around the Andalusian countryside, the most famous being the town of Ronda, high up on over the Tajo gorge. Best for: Everything but rolling green hills! Alternatively... You can't compete with Andalusia on its own merits. But for something as far from Andalusia as possible, Galicia fits the bill.